조선 후기에 제작된 채색필사본 지도첩이다. 총 3책으로 구성되어 있으며, 제1책에는 세계지도, 중국지도, 북경과 한양도성도, 전도를 포함한 6장의 지도가 포함되어 있다. 제2책에는 정상기(鄭尙驥)의 『동국지도(東國地圖)』유형의 조선 도별도가 수록되어 있다. 또, 제3책에는 중국 각 성(省)의 지도 16장이 실려있는 등 일반적인 조선후기 지도책과는 내용 구성에서 차이가 있다. 제작 시기와 관련하여서는 수원에 사도세자의 무덤인 현릉원(顯陵園)이 표시되어 있으며 수원부의 치소가 이전 된 것으로 묘사되어 있고, 경기도 금천(衿川)이 시흥(始興)으로 바뀌기 이전의 지명으로 반영된 것으로 보아 1789년~1795년 사이의 지리적인 내용을 반영하고 있다. 제1책에 포함된 「천하도지도(天下都紙圖)」는 당시 중국에서 제작된 서양식 세계지도가 모사된 것으로, 당시 조선 지식인들이 접한 세계지리의 내용이 잘 담겨져 있다. 또한 「조선일본유구국도(朝鮮日本琉球國圖)」의 경우 조선을 중심으로 하는 동아시아의 지리적인 내용을 담고 있어, 이들 지도들은 매우 귀중한 자료로 평가된다. This is a comprehensive atlas consisting of three volumes of hand-drawn colored maps of diverse realms, including the world capitals (Cheonhado jido), the Joseon-era Korea (Joseon jeondo), the capital city of Joseon (Doseongdo), and counties (Gunhyeon jido) throughout Joseon. The first volume contains maps of Korea, its capital city, travel routes of Joseon diplomatic missions visiting China, and China. The second volume has maps of individual provinces, and the third volume maps of Chinese provinces. It is not known exactly when this atlas was produced but the cartographic techniques and expressions are remarkable. 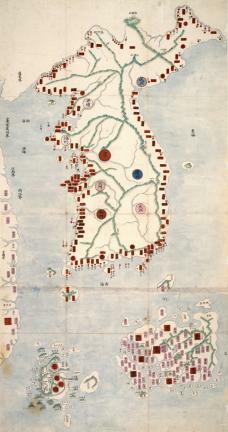 The maps are among the earliest detailed maps of Korea and are highly valuable materials historically and academically.